Sticking to a new diet or exercise routine is challenging – especially when beginning. We’ll need to call into service our army reserves – willpower and self-discipline. If we have not been developing these two mandatory elements then experiencing success will be challenging at best. Research and ongoing studies have proven over and over the positive effects that meditation provides us in regards to developing strong mind control, self-discipline and willpower. It improves memory, is a super anti-aging strategy and the perfect way to tune into your body and listen to what it is telling you. Meditation offers a world of benefits and can be done by anyone. Focus, memory, attention span and age-related cognitive decline all benefit from the practice of meditation. You could even think of it as a natural form of medication for the brain. With today’s hectic schedules and increasing demands, finding “quiet” time to meditate can sometimes be challenging and opens the door to our “favored” excuse. However if meditation is worked into daily activities then it’s easy to participate without exception. The activity of walking itself has proven therapeutic and hence the popularity of walking meditation. Usually done in a quiet environment without disturbance, traditional type sitting meditation can be expanded to include “walking meditation.” Walking meditation is simply a form of “meditation in action.” Because nearly everyone does some form of walking daily, it is the perfect opportunity to turn a common everyday activity into a meditative practice offering health and longevity benefits. Walking meditation is nothing new. It has been an essential part of Buddhist training for centuries. Monks will walk for hours in order to develop focus and high levels of concentration. It is an invigorating activity and when emotions are strong and stress sets in, walking meditations can be more relaxing than sitting meditation. When performing “walking meditation,” we employ the physical, mental and emotional experiences of walking as the basis for developing greater awareness. And, because the body is moving, it is easier to stay anchored in the present moment and remain aware of bodily sensations and many people find it easier to perform than sitting meditation. When performing sitting meditation, the sensations that arise in the body are much more subtle and harder to pay attention to that those that arise while we are actively walking. This makes walking meditation a highly pleasurable experience and we all know the healthy role that “pleasure” plays when trying to develop a new habit. Unlike sitting meditation, walking meditation is obviously done with the eyes open and body moving. It is the perfect solution to squeezing more meditation time into the day because you can take advantage of all the times you walk. Each spell of walking throughout your day, no matter how short or long in duration can be turned into valuable meditative practice time. Be aware. Before beginning a “walking meditation” feel your weight being transferred into the earth on the spot you are standing. Spend a minute or two just standing there, focus on your breathing and get your attention focused on your body and the sensations you are feeling. Slow is better. 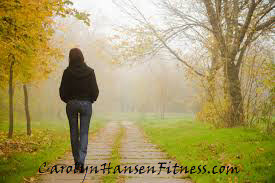 Walking meditation is usually done at a slower pace than normal walking and coordinates with breathing. Keep your pace steady and even. Walk very slowly until you can stay focused in the present moment with every step you take. Spend at least 15 minutes moving. Since there is no discomfort associated with walking mediation, (as there sometimes is with sitting meditation) you should be able to perform it for longer periods of time. Choose your place wisely. Don’t perform your walking meditation in high traffic areas or heavily populated areas. You want to feel safe from beginning to end. Choose a path that is slightly enclosed so there is less distraction for you and your mind can more easily travel inwards without fear. Control your thoughts. Whenever your mind begins to engage in mental thoughts about your surroundings, simply bring it back to your walking pace and follow your breathing and bodily sensations. Remain centered: There is nowhere to go in thought. It’s a matter of mastering your attention, focus and presence. Simply BE the process as it unfolds. As an added bonus, walking meditation can actually build stamina and strength as well as allowing a quiet, focused mind to become an integral part of your life, whether you are walking to work, in your neighborhood after dinner, or walking for fitness. It makes good sense to achieve two things with a single action – quieting your mind as you improve your health.